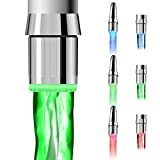 Sometimes the simplest little gadgets can be so cool, and that’s exactly the case with the DLAND RC-F03 Colorful LED Water Faucet Attachment. This little device screws into any standard tap in your sink and water flows through it normally. But here’s the cool part: it has different color LEDs inside that automatically turn on when water flows through it! Red means hot, blue means cold, and green means just right. 2-packs are only $9.99 right now on Amazon, so definitely check it out.